These beautiful pine cone blanks consist of miniature pine cones cast in colorful pearlescent resin that can be polished to a glass-like finish. 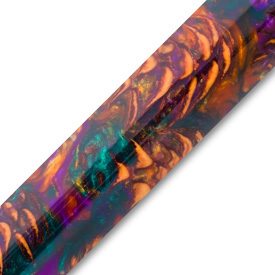 The unique patterns created by the pinecone, along with the depth and iridescence of the resin, give these blanks some serious ‘wow’ factor. Although they are perfect for use on one-piece pens, they look equally good on two-piece pens too! Comments On Sep 08, 2018:When turned these blanks have an unusual look to them as the pine cones turn into little starbursts of wood. They turn very well however and accept a CA topcoat very easily. The CA topcoat also allows them to be polished to a high gloss to bring out all the depth in the resin.